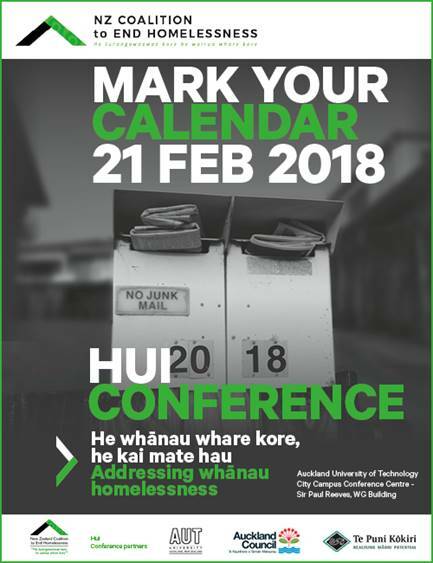 The New Zealand Coalition to End Homelessness (NZCEH) is honoured to invite you to attend the 2018 ‘He whānau whare kore, he kai mate hau/Addressing whānau homelessness’ hui/conference to be held on the 21st February 2018 at AUT City Campus, Conference Centre, Sir Paul Reeves, WG Building. We extend a warm invitation to service providers, academics, researchers, government agencies and community practitioners. We encourage you to sponsor members of your homelessness community to attend the conference. If you require an invoice to pay your registration fee, send an email to Iris Pahau at info@nzceh.org.nz.